The Sri Lanka Air Force (SLAF) has deployed a Bell 212 helicopter fitted with a Bambi bucket to help douse the fire at a clothing store in Pelawatte. Meanwhile the power supply to the area has reportedly been suspended as a precautionary measure. The Emergency Fire Service of the Kotte Municipal Council deployed several fire trucks after a fire broke out at a leading clothing store located near the Pelawatta Junction in Battaramulla. 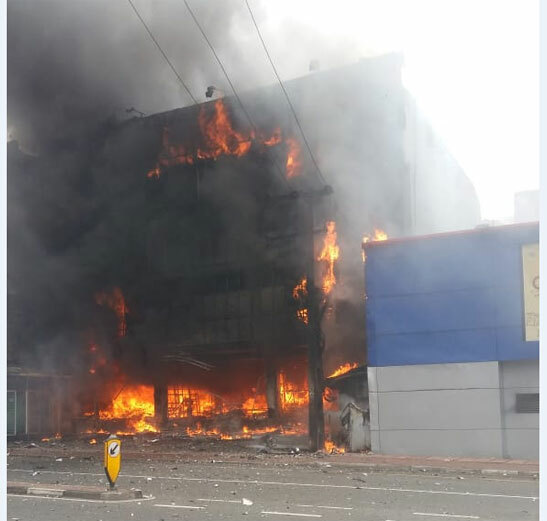 The clothing to homeware store has been completely gutted in the fire, which had broken out at around 11.00 a.m. this morning, despite the continued efforts by firefighters to control the flames. The fire had also spread to a nearby tyre shop and other building in the vicinity. The Kottawa - Borella Road (174 bus route) has been closed for traffic at Pelawatte due to the fire. Both lanes of the road section in front of the clothing store continues to remain closed off for traffic due to the fire.